If you're buying real estate in Boulder (or anywhere else for the matter), there's something you should know. This isn't exactly a secret. Some parts of Boulder are more desirable than others. For a variety of reasons, certain areas have cache, others are better for commuting, and some are seen as more desirable simply because they're filled with grand historic homes. Some of this is captured in "Location, Location, Location." But it turns out the old mantra is only half the story. While it emphasizes the importance of location, it fails to suggest getting a broader understanding of the value of a neighborhood or community before buying. As my simple little chart shows, there's a straightforward and linear relationship between a home's price and the location. To get the most for your real estate dollar in Boulder, it's both critical to understand how location is perceived and keep in mind the intrinsic value for you and your family may not be the same. 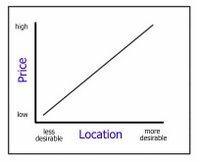 To find great properties, you have to go beyond square footage, bedrooms, and bathrooms and understand the context of location. Let's get back to Boulder. On a larger level, our city has an obvious price premium to surrounding communities. When people buy here, they're paying for the real and perceived value this community offers. As I like to say, "they're not just buying a home, they're buying an opportunity to join the community." The further you drill down, the more distinctions you'll find in neighborhoods. From the obvious cache neighborhoods (Mapleton Hill) to more subtle differences, it adds up. And while you may not grasp it all before you buy, you will certainly come to know them over the years. So finding out everything you can about a neighborhood now, how it's perceived by the community as well as how it might fit your family's needs, is what smart home shopping is all about. When it comes to intrinsic value, the neighborhood itself is within walking distance of two grocery stores and a variety of shopping. It has bike paths and a great public park. Recent improvements at the Table Mesa shopping plaza, in particular the addition of restaurants like Southern Sun and coffeeshop's like Cafe Sole have rounded things out nicely. Why drive (or take a 15 minute bike ride) downtown? Still, for now many people continue to perceive Martin Acres as a "starter" neighborhood. Given the number of luxurious "pop tops," this could change rapidly. If you're a buyer, don't underplay the importance of finding out what you know and what you don't know about neighborhoods in Boulder. The true value of a home is based on a combination of factors specific to the property and the value of the community in which it lies. And be sure to consider the importance of direction the neighborhood is moving in to get the most bang for the buck. Can you post a link that gives an overview of area schools? I have some friends coming to work at Amgen in Longmont and they want to decide where to look. Where do most Amgenites live? What are schools like in Niwot? They have a 5 and 7 year old I think. 1. Start by searching for property in Niwot. Click HERE for a direct link to my property search page (no registration, etc required). Last point - remember that Boulder has an open enrollment policy. That means that your child can attend a school other than the one serving her neighborhood, but the parents will have to provide the transportation. There's also a lottery system to determine eligibility. Here's more on open enrollment and a flowchart of the process. I thought your question great, so I moved it up to post status.